Andalusian tomato soup with EVO, peppers, cucumber and Sherry vinegar. Gazpacho or Andalusian gazpacho is a chilled soup made of raw, blended vegetables. It is a classic of Spanish cuisine originating from the southern region of Andalusia. Gazpacho is one of Spain’s most famous dishes. Made using raw blended vegetables, it’s served chilled and perfect for a light healthy refreshing summer snack, canape, lunch or dinner. The vegetables used to produce ArteOliva gazpacho are sourced from the Andalusian region of Spain and delivered in fruit crates for protection. Before the vegetables are washed, they undergo a selection process to eliminate any that have been damaged. Once selected the vegetables are washed and then transferred onto a belt where they are brushed to remove any remaining impurities. The vegetables are then placed on the hammer mill, where they are crushed, along with the bread and garlic, and converted into a purée that is sieved to remove the skin and seeds. The washing and crushing process is carried out at less than 10ºC. The time for the vegetables to be crushed and the gazpacho to be packaged does not exceed 1.5 hours. Keeping all the nutrients in the Soup. ArteOliva has the best technology available for packing the gazpacho, whilst the Tetra pack extends the longevity of its life. The result: the best gazpacho on the market. 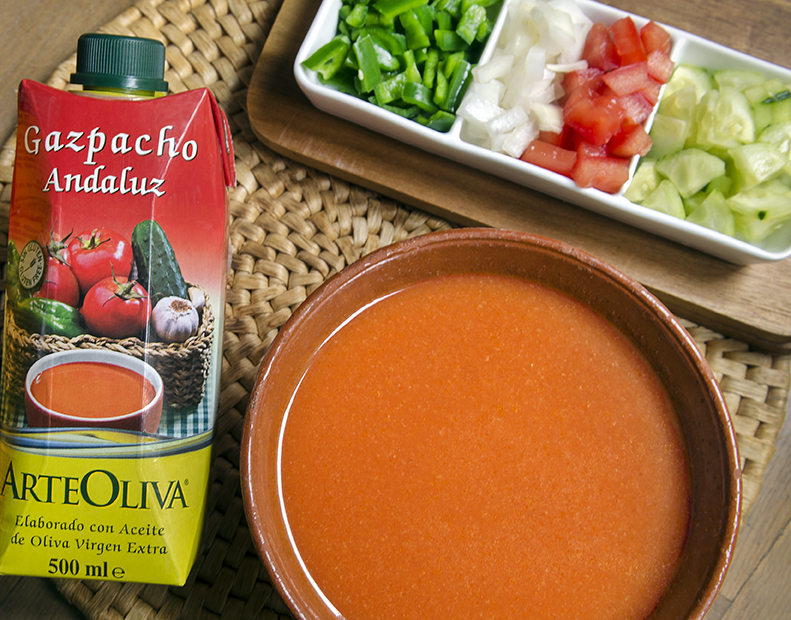 Try it and discover the real gazpacho!